3 Bedrooms | 2 Bathrooms | 2,099 Sq. Ft. The perfect Custom Built Family home on 8+ Acres. You will love the open spaciousness as soon as you enter this split floor plan home. Ceramic tile throughout the living area and carpet in the bedrooms. The great room is an amazing, sunken area with floor to ceiling stonework on the fireplace that reaches up to a tongue and groove ceiling with incredible wooden beams secured with bolted steel plates. 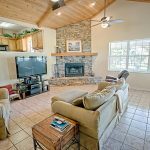 The Master Bedroom retreat offers all the comforts you expect in a personal retreat including a separate tiled shower, garden tub, his and her sinks, and a Huge walk-in closet. The kitchen is the perfect location for entertaining with a breakfast bar that overlooks the great room and custom, solid wood cabinets. Your surrounding land is covered in trees and is secluded from neighbors.